America's contemptuous dismissal of the International Criminal Court's attempts to investigate allegations of torture against US soldiers in Afghanistan demands a relook of African leaders' long-standing criticism of this institution. The International Criminal Court (ICC) was established in 2002, in terms of the Rome Statute. The Rome Statute defined four international crimes: genocide, crimes against humanity, war crimes and the crime of aggression. For a long time the ICC has been condemned for its one-sided prosecution of Third World leaders accused of such crimes. While it has investigated and jailed warlords like Charles Taylor, and even declared Omar Al-Bashir a wanted man, the court's attempt to investigate the crimes of American soldiers in Afghanistan has led to a nasty response from the US National Security Adviser, John Bolton. Late last year the ICC opened a file to investigate the allegations that US military and CIA personnel committed acts of torture in the 17 years that the US has operated in Afghanistan. The investigation was opened by an ICC prosecutor from The Gambia, Fatou Bensuda. The US is not a state party to the ICC, but Afghanistan is. The ICC therefore asserts jurisdiction over Afghanistan, regardless of the nationality of the perpetrator. In response to the ICC's move to prosecute US military men who were involved in detainee abuse in Afghanistan, John Bolton said, "The United States will use any means necessary to protect our citizens and those of our allies from unjust prosecution by the illegitimate court." 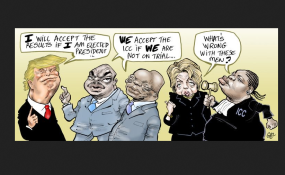 While attempts by African countries like Burundi and South Africa to withdraw from the ICC was heavily condemned, it is noteworthy that the ICC has often come under criticism from African leaders. Uganda's President Yoweri Museveni once referred to the ICC as "a bunch of useless people". Kenya's President Uhuru Kenyatta said the ICC was a "tool of global power politics and not the justice it was built to dispense". It is also interesting to note that the cases handled by the ICC were mainly instigated by the African countries involved. Adotei Akwei, managing director for government relations at Amnesty International, rebuked the US position, saying its rejection of the ICC's legitimacy "is an attack on millions of victims and survivors who have experienced the most serious crimes under international law and undermines decades of ground-breaking work by the international community to advance justice." Given America's flagrant dismissal of the ICC, African leaders seem justified in their distrust of the court. The question that arises is this: If the court can't deal with the powerful, how can its existence be justified?